When I first signed up for this class, I honestly didn't really know what to expect. Walking into the first class, I mused that my mediocre drawing skills wouldn't measure up to some people's since I was never serious about being an artist or the like. My mom had been a sketch artist and was a phenomenal artist, but I had inherited maybe half of her talent, if that. I had taken ceramics in high school and thoroughly enjoyed it, but I knew that aside from drawing animals, I had no chance at sketching humans, buildings, or even creative doodles. After walking around the room the first day when everyone had completed their study drawings, I knew I was right. What was I doing in this class? In the beginning, I couldn't say I loved the class, but as I developed more of the basic drawing skills (that I never learned from formal teaching), I began to enjoy it. As much as I loved the getaway from menial, everyday biology problems, a part of me hated that I always took so long with drawing as my (slight) OCD caused me to pour over every single detail of a drawing. And when all that time added up going over every detail of a huge sketchbook page, I have to say I did rush parts of my drawings sometimes. In the end, though, I think the pros of taking this class outweighed the con of spending a lot of time on it. For example, in high school, I always loved reading into the messages of literature. Near the end of our class when we started to delve into creating messages and themes into our drawings, I enjoyed exploring the ways I could utilize my new drawing techniques to convey what I wanted to say to my audience. I also found it interesting that nearly every other person had their own style and way of delivering messages through their pieces - whether intentional or not. Creating titles for my last two drawings was a fun task and I'd like to say I had a knack for making up witty or clever titles as well. Before this class, I had never really drawn. My best drawing was really close to something that kind of sort of maybe looked like a stick figure. Maybe. I had always wanted to learn how to draw, and I even looked into some courses in my hometown, but it never fit with my schedule. When I learned that there was a class at Duke that taught drawing, I wasn't sure if I would have enough skill to take it and pass. On the first day, my fears were confirmed when I saw all of my classmate's sketches. I couldn't even draw a table. A TABLE. I remember literally spending the entire class working on how to draw the table: aka, the thing that was holding everything else every one else was drawing. hahah BUT, I did not get too discouraged, and I am glad I kept with it, because now, I can produce works that I am proud of. I even post some of them to my social media pages, woo! Also, my mother has begun messaging me every wednesday night asking to see my drawing. However, aside from having a tangible work to be proud of, I am glad that I took this class for the skills that I have learned. I am so much more observant now, and I see my environment differently. I really began to notice this when we worked with negative space and shading. Realizing that there is more to an object than its details has helped me to analyze better in all of my classes. I have learned a lot of different analytic thinking approaches this semester in all of my classes, and this class helped me most to think about problems in a larger context. I can sometimes go to far with the intricate details of things, but this class helped me to see the larger picture. Growing up, I was always surrounded by art. My father was a biotech researcher by day, self-proclaimed artist by night. The walls of our apartment then were always full of his Chinese-style paintings of bamboo, chrysanthemums, chicks and roosters that symbolized good luck. 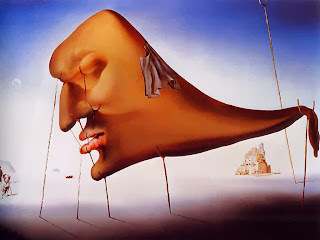 I adored those paintings as a child. 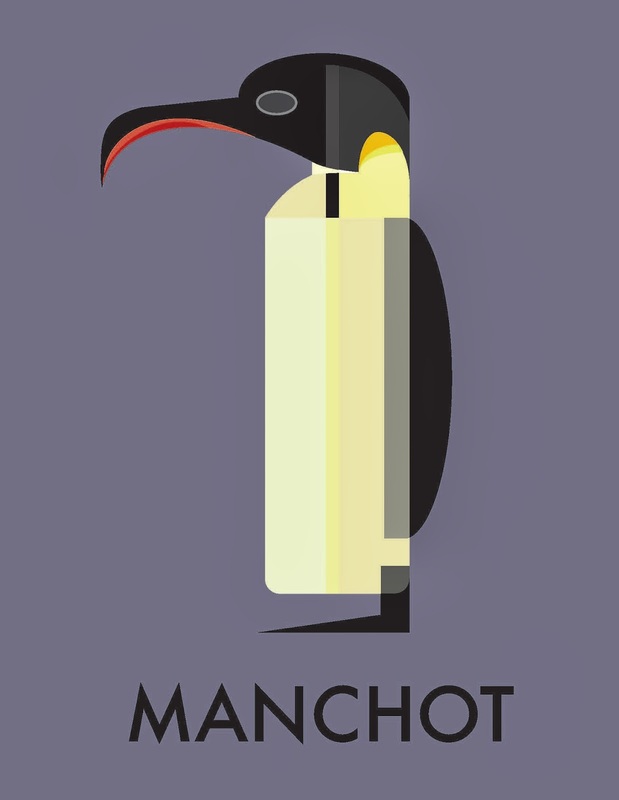 I couldn't get over how he could start with a ball and end up with a chick, or how individual segments that looked like bones,when put together with a few additional seemingly carefree but deliberate strokes, so remarkably resembled bamboo. It was my own personal form of magic. While my father's pursuits piqued my interest in art, it was the painting class they enrolled me in and the various art classes I took henceforth that really helped my budding intrigue bloom into passion. I got my parents to buy me sketchbook after sketchbook, to fill my desk and drawers with countless colors and weights of pencils, colored pencils, markers, paints, and pastels. I absolutely loved going to art supply stores, and could spend hours in them fantasizing about what I could do with the materials inside. Yet over time, art lost its grasp in my life. It wasn't that I had lost my passion for it. Other things just started taking precedent. Schoolwork, extracurricular activities to boost my resume, sports. Hanging out with friends. Art is time-consuming, and as a middle schooler and high schooler, I didn't want my friends to leave me behind just so I could draw. But that didn't mean I didn't miss it. That's the reason I took this course. I wanted to bring art back to my life. I enrolled thinking it would be fun and a destressor, a nice break from all the papers and problem sets of my other classes, and it was. I thoroughly enjoyed all of my assignments in this class. However, this course also reminded me just how time-consuming drawing can be. There were a couple of nights where I just couldn't see the end of a piece of work, where I wanted to just toss in my towel and withdraw. I was overloading after all, and with classes that weren't exactly light in course load. But I found that persevering helped me as grow and ultimately I am thankful for this class. This class taught me to go out of my comfort zone. I had never drawn on such large canvases before, and was skeptical on how they would turn out. By dedicating the time to figure that out, I regained my love for drawing, for creating and recreating what I saw as beautiful. I also had shied away from creating my own art in the past. My sketchbook helped my get over that hump. Through my sketchbook I was able to explore things that I had considered a weakness. Drawing trees and faces, the human body in general. But also the ignoring the impulse to make everything perfect. I dedicated a number of my sketchbook pages to Sharpie drawings. I wanted to work with something that I couldn't erase so that I could slowly learn to deal with the fact that my drawings were imperfect. That way I would in general draw more, because one of tree main things holding me back is how long it takes me to complete a drawing because of how much I nitpick over details. Overall, this course has taught me that I can make time for art in my life. It may have taken me over half a decade to come to this realization, but I am determined to hold on to it. When I first signed up for this class, I wasn't sure what I was in for. I have dabbled in drawing and other visual arts but I have never had the opportunity to try and hone any sort of skills, and I thought this was the perfect opportunity. Although I quickly realized that my ability was nowhere near that of the other students, I did really enjoy the class. It was hard for me to see my work, which I knew still needed a lot of work, hanging up next to all of the beautiful drawings other students had created. However, this did help me to stop comparing myself to the work of other people, which I have been struggling with in many classes other than drawing. I stopped looking at what everyone around me was doing, and focused on the progress I was making. And I saw that I did learn a lot. I think that the shaky, sketchy drawings I started out creating are much different than the final drawing I produced. And though it was hard after seeing where everyone else had ended up, I did leave the class proud of my final drawing and my portfolio and of all the work I had put into them. In the end, I am really glad that I took this class. It was really fun and a good way to start every week. Thanks for an awesome semester! The main way I was introduced through art is through my girlfriend of 5 years. She is a fine arts major and I have always been surrounded by art, although I have never had much technical skill at it and I thought this class would be a great way to build a solid foundation. I feel that I did gain a good technical level of skill from this class and I really liked the focus on drawing from observation. I particularly thought using negative space to help guide drawing was especially useful to me. My main creative outlet before drawing was producing music and film. One small thing that I noticed that made drawing enjoyable was that I could listen to music while drawing which is kind of ironic. While editing film or producing music, it would be impossible to listen to music because you have to be listening to what you are working on, so I really enjoyed that aspect of being able to relax and listen to music while working. However, I found that working under deadlines was very stressful and I usually work on creative endeavors outside of academics so it was difficult for me to get used to that. Also while I liked the way the class was structured, I felt like it was a bit limiting creatively which made it a bit harder to be motivated to draw. I also felt a lot of anxiety, which happens a lot when working creatively, especially under deadlines. I felt fear of failure. Having little confidence in my drawing ability, I would get anxious about starting a drawing knowing that it probably wouldn't come out the way I wanted it to. So often I would avoid starting it leading to procrastination. I think having more confidence in my drawing and also more patience will help me not get so frustrated. I have habitually used Visual Arts as an outlet, so I was naturally engrossed in taking Drawing at Duke for one of my elective courses and potentially minoring in Studio Art. I knew that transferring from a small, single-sexed school in Philadelphia to Duke's Pratt School of Engineering, where seventy percent of the students are male and the academics are basically all math and science, was going to be a major adjustment. This made me even more engrossed by taking Drawing, because I was able to preserve my outlet when being in a whole new environment. Once I arrived in Duke, people were a little confused as to why I was taking this course because generally it is considered to be incompatible to engineering, but I believe that they instead coincide. As a student interested in science, visual arts, and mathematics, I have always been intrigued by engineering's unique emphasis on blending innovation and creativity with real world pragmatism. 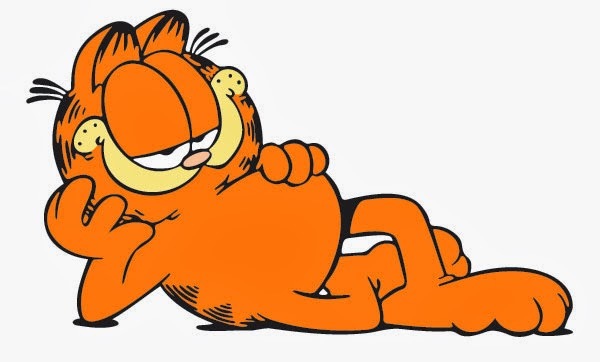 Drawing has enabled me to think conceptually, thus allowing me to best capitalize upon my ability to alternate from engineer's natural was of thinking analytically. Moreover, taking this class would improve my dexterity, which is an important skill to have as an engineer. Since I am considering majoring in Biomedical Engineering and potentially pursue a career in medicine, the ability to have excellent hands on dexterity is critical. Although I knew that being in Pratt was academically demanding, I did not understand the full extent. This semester I have been in three courses with a lab along with being consistently sick, which ultimately deterred me from immersing myself into my drawing assignments, especially in the beginning when I was adjusting the new workload. Instead of an outlet, drawing for a certain deadline just exacerbated my stress. But once I learned how to handle the obscene amount of work from my other classes, I was excited that I was finally able to dedicate more time to my drawing assignments. When there were times that I was able to focus on my drawings, I particularly enjoyed drawing freely in my sketchbook. In my sketchbook I finally drew facial features for the first time ever along with random objects. Although I will probably not be able to minor in Visual Arts, I do hope to take another class in the future when my other classes are not as demanding. It’s O-Week, everyone’s in a feverish spree of getting to know each other, and from whomever you talk to, you always end up getting this question: “So, what classes are you taking this semester?” Whenever I mentioned drawing class, half of the questioners said “oh” and revealed that they also loved to draw when they were young. I was intrigued by how at one point in their lives, a number of people loved drawing. When I was young, I also loved drawing without a doubt. 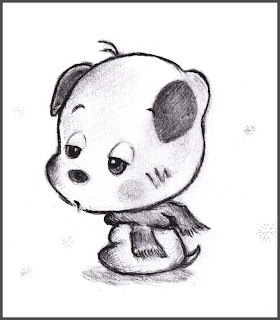 But somehow, as I got older, drawing became something more complicated. I began to worry about what others would think about my work, compare mine to others’, and draw in a standardized way just to fit into other people’s expectation. Even a small scribble had to become a complete work of art for me. 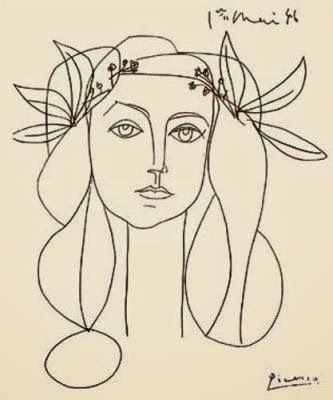 I was beginning to lose Elaine who just loved to express herself through drawing. And once I started to lose her, drawing became a burden instead of a fun activity. I noticed that change within me during ArtsConnect activity while teaching art to elementary school kids. To the kids, the definition of art seemed to be “making a mess.” But however crude their forms were, surprising creativity and imagination stemmed from their small hands. And they were obviously drawing whatever they wanted to draw, enjoying the moment instead of worrying about other people’s reaction. I used to have trouble expressing myself even on the sketchbook for the drawing class. But ever since learning from the kids, I began to really think about what I liked to draw and express it. For instance, I like capturing the atmosphere of a human being. My sketchbook is full of humans in different postures with different expressions. The sketchbook became a ground for me to draw freely. That is how I think I took a step closer, even just a bit, back to the nature of drawing. There are some people in this world whose talent just makes your jaw drop. I’m talking eyes-bulging, mouth-agape, how-did-they-do-that type of astonishment. I am fortunate enough to be able to say I know a few people who have left me floored on numerous occasions with their knack for expressing themselves by way of visual arts. 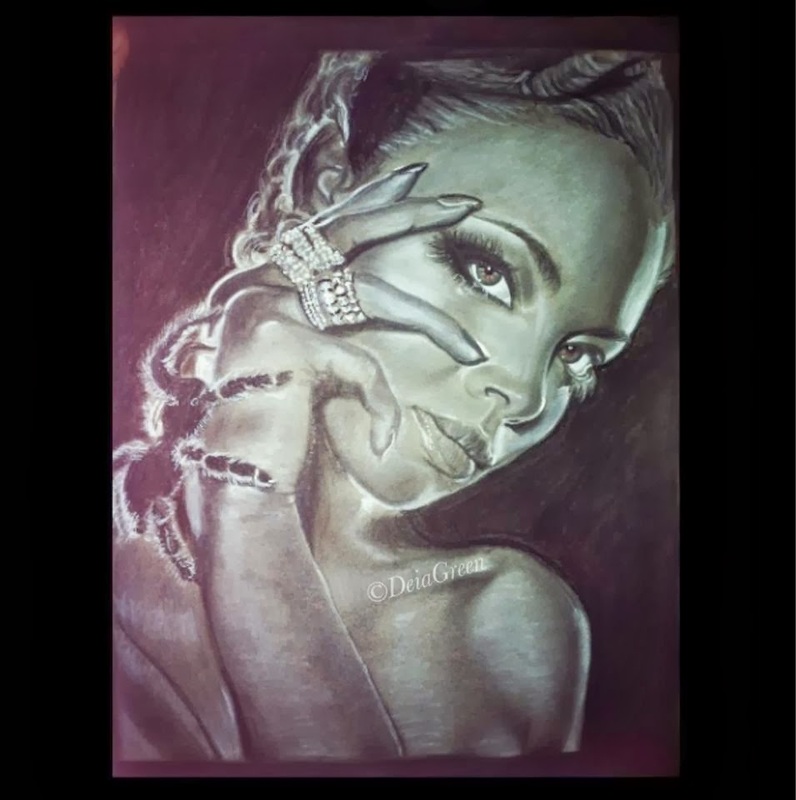 My best friend, Deia Green, for example, has always been able to put pencil to paper and produce something amazing. She is one of my favorite artists. She currently attends Virginia Tech as an Industrial Design major and has loved drawing for as long as I have known her. It was evident even in the fifth grade that she had something special. I remember vividly the day she brought in a piece of paper with sketches of human torsos to show our teacher. There was a distinct maturity to her style that far surpassed the work of many kids our age who were still amidst the stick-figure phase. Since then, she has expanded her repertoire, experimenting with a number of mediums, with digital drawings on tablets being her most recent venture. Part of the reason why I decided to take a drawing class this semester was to explore my own skill set and expand upon it with new techniques and practice. I am very glad I decided to take this class while at Duke as I have seen my style improve and alter with each new skill we studied. I always wanted to take art in high school, but APs and extracurriculars just wouldn't allow it. I love drawing, and I have found that I prefer it more when it’s less restrictive and I can just draw whatever comes to mind. I like to doodle a lot and the margins of my papers are often speckled with the products of wandering thoughts and daydreams. In this way, drawing has always been an outlet for me. It helps me clear my head and I find it extremely relaxing. Having to work to meet a deadline sometimes took the relaxation aspect out of the process. However, being able to express my creativity amidst working on my core classes has proved to be a great benefit to me this semester. There’s a building whose name I do not know. Everytime coming out of Smith Warehouse after the class, I see it standing tall and shining at the far end of the road, like a realistic dream which seems within my grab but still unreachable. It’s not really tall, only 20 floors or so, but tall enough to stands out from the other buildings in downtown. It's not really shining, only wearing several lights and the reflection of the sunset, but glittering enough in the watercolor-like sky to catch my eyes. When staring at it, I hear the singing of Siren, feeling the irresistible attraction to approach. It's like an old friend that I’ve lost connection with for a long time; it’s like a lighthouse that keeps giving out the soft glow; it’s like a exotic landmark of an whole new world I’ve never explored before. So I walk, walk towards it consciously and unconsciously. Unfortunately, I’ve never made it there, at least so far. After the last drawing class, I carried my sketch board back to dorm. As usual, I was staring at the building during leaving Smith Warehouse. My phone was playing some old songs, and I suddenly felt so wistful, so longing, while so excited---a kind of mixed and indescribable feeling crowded in my mind and was about to explode. I wanted to splash the exact same color of the sky on a huge wall; I wanted to smash the guitar on the ground; I wanted to laugh and cry loudly on the road. I sat down on the ground, grabbed a pencil, and opened the sketchpad. I sketched out abstract lines and wrote inconsistent words. Alright. Whatever. Nevermind. This was the way I let my feelings flow out. I felt the world was shut down, without noise, without pedestrians, without any other distractions. It was just the building and me sunk deep into the light pink and blue clouds. At that time, I realized that it does not matter if I will finally get to that building or not; I was currently looking at it. I felt free. I guess it’s not just about the building; it’s about drawing and me. Whether by painting on a canvas or by doodling on a worksheet in class, art is an escape from my world. Being a pre-med student at Duke University is hard. Being from a family of doctors makes the expectations of being a pre-med student even higher. For the first time, however, I am taking a class that has nothing to do with my major, my pre-med requirements, or what is “recommended”. I decided to take this class for myself. Throughout high school, I felt pressured into taking all the classes that would make me seem to be the most “well-rounded” student. I took as many AP classes as I could, played sports, and was involved in many clubs. Art was simply not a part of my life—but I loved it anyway. I realized my interest art too late and promised myself to expand my artistic skills in college. Freshman year passed in a blur, and before I even knew it I had consumed myself once again in pre-med classes. Its funny how quickly college flies by. Before I know it I’ll be wearing a cap and gown, sitting in Wallace Wade stadium, listening to the commencement address. I refuse to lose myself in the medical tract and because of that I decided to take Drawing 101 this semester. In gathering my portfolio for this class, I realize amazingly how much my skills have improved. I can’t believe how far I have come since August. Looking at my last few drawings, I am really impressed with my shading and the contrast of dark and light. Compared to many people in the class, my drawings were nowhere near as advanced, but I am still very proud of myself and will definitely continue to practice my skills. I have learned a lot about drawing techniques, especially how to use a tool as simple as an eraser to change the whole scheme of a sketch! Although this class took up a lot of my time, I enjoyed doing the drawing assignments to de-stress. It was a great way to relax after a hard chemistry exam or a Spanish presentation. I could simply plug in my headphones and draw for hours without realizing how much time has passed. In that way, I could forget about my worries, and just focus on the piece of paper in front of me and the pencil in my hand. Art has always been and always will be the greatest escape, and thanks to this class my skills and confidence in drawing have grown significantly. Duke is a funny place. This semester I, like most Duke students, was enrolled in four classes. I fully expected Drawing to be the easiest class I would take in my college career and that classes like my advanced PubPol class or Botany to be more challenging. I couldn't have been more wrong. Though I was a decent drawer in high school, I came into Drawing 101 at Duke so poorly qualified compared to everyone else. My remarkably inferior talent for drawing wasn't completely apparent the first few weeks of class because we didn't discuss each other's art until later in the course. When we started doing that, though, I started to dread coming to drawing. I knew that no matter how much time (often upwards of 6 or 7 hours) or effort I spent on that week's assignment, I knew that my drawings would be the worst in the class. By about 6 weeks in, I was really regretting my choice to take drawing. It wasn't until the last assignment that this attitude shifted. Though it was still the worst in the class, I was really proud of the drawing I turned in for the fantasy narrative assignment. I drew the VDH Pavilion on West Campus surrounded by fairies and a pumpkin carriage. It was a play on "The Magic of Finals Season" because, let's be honest, we all need a little magic to get through finals in one piece. It was by far the best drawing I had ever done in my life, which is a huge relief since it took about 10 hours to complete. I came into class with a huge smile on my face because I just knew that this time Professor Fick would have nothing but complementary things to say about my drawing. My smile faded a little once I saw everybody else's drawings. Everybody else had also pulled out the big guns for this final assignment. I was still proud of my drawing but I was expecting to be right up there with the best of the class for the first time and, instead, I was towards the bottom again. This was further reinforced when Professor Fick got to my drawing. Few compliments were paid, plenty of (constructive) criticism was given. I left class slightly bummed. However, after a mini pity party, it occurred to me how much I had improved by the end of the course. The whole time I had been comparing myself to some of the best drawers I had ever seen. Drawing is their thing. Many of them even said they were planning on majoring in art. Instead of basing my talent off of their's, I should've been focused on noticing my own improvement. In flipping through my drawings from the beginning of the semester, I could hardly hold back laughter. Instead of feeling down in the dumps about how I really have no future as an artist, I decided to celebrate the fact that I had learned so much and have been privileged enough to draw among several artists that will undoubtedly have extremely successful careers. All in all, I am so glad that I took drawing if for no other reason that I now know how I can approach classes that challenge me beyond what I'm comfortable with. So, on that note, thank you Professor Fick for helping me to become a better drawer as well as a better all-around student. Recently I have made a point to look at little kids in restaurants- fighting over an iPad or Gameboy etc. and think back to what I did in their shoes. A marker pouch and pad of paper were essentials for every outing or event I was going to. At some restaurants I would be blessed with a paper table covering and move all the plates to the side as I filled the page with anything I could think of. There were dragons eating cars, elephants with trumpets as a nose, women with cats living in their hair and much much more. 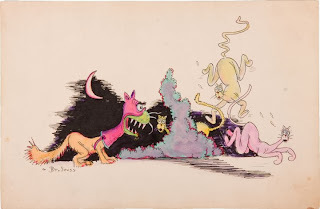 My mom read a lot of Dr. Seuss to me when I was growing up and that gave me this mindset that pretty much told me, "the weirder, the better." I started writing picture books at around age 3. Due to my age and ability, these were not always cohesive (or legible) but were still quite colorful and interesting. I like to look back on how my style evolved with age and exposure to other artists. My Aunt, Becky Hall Fehsenfeld, is a talented painter and I learned a lot from looking at her drawings and paintings. My mom is an avid doodler and has taught me that even To-Do lists should have a few characters to liven things up. I went through a period from age 10-13 where I wasn't seen without a comic book in my hands. By comic book, I do not mean Spiderman, I mean the collections of comic artists found in the paper. Jim Davis's Garfield was hands down my favorite, I own every treasury and would practice drawing the scenes and creating my own comic strips. I explored many other comic styles from Far Side to Marvel and enjoyed learning about all the different ways people drew. 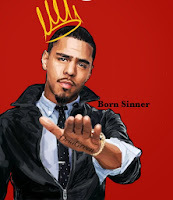 After I started high school, I shifted my interest to artists like Picasso, Da Vinci, Degas and Van Gogh. It was fun trying to imitate those styles with painting but from internet research and books at the library I also was exposed to some of their drawings. My exposure to photography (wink) during high school also ended up changing my style of drawing dramatically. I was drawn (I can't stop) to black and white images with a lot of contrast. It seemed that the more contrast in the image, the more power it had. I switched from pencil to more marker based drawings at this time. Now, Frida Kahlo and Salvador Dalí are all I can think about. 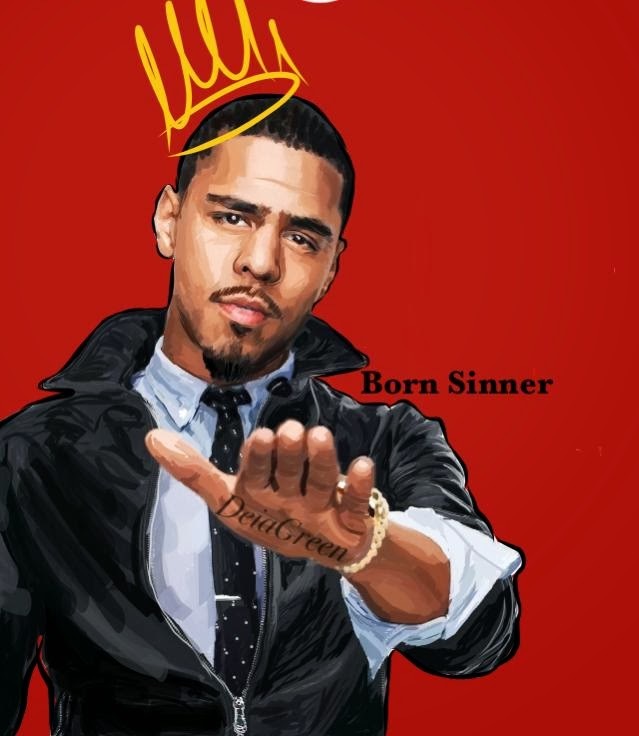 I absolutely love both of their styles and the stories behind how they became such influential artists. I am excited to see how this new inspiration will add to my style. Every notebook of my academic career contains countless amounts of drawings. I used to use my excess energy in class by doodling and drawing my teachers and classmates as cartoons. I love to make myself laugh with what I draw so when I look back at these notebooks I crack up. I am an avid travel journal writer. I have been lucky enough to travel a lot and every trip I keep a journal of thoughts, drawings and wonderings so I can relive the trip by reading it. But my favorite use of my drawing skills is at my job. I work as a graphic designer and I constantly get to draw and create on the computer and in notebooks. It is thrilling to know that I can do what I love and possibly support myself on that in the future. 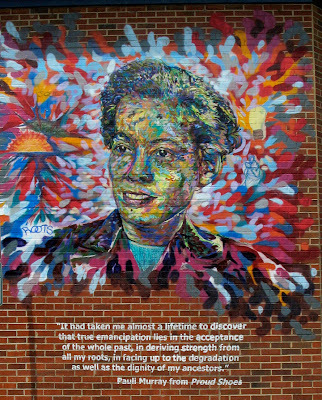 In one of my drawings this semester I drew one of the murals in downtown Durham of Pauli Murray. Whether or not you know who Pauli Murray was, you’ve probably noticed the various murals of her around Durham like this one on Buchanan Blvd. Pauli Murray Mural on Buchanan Blvd. 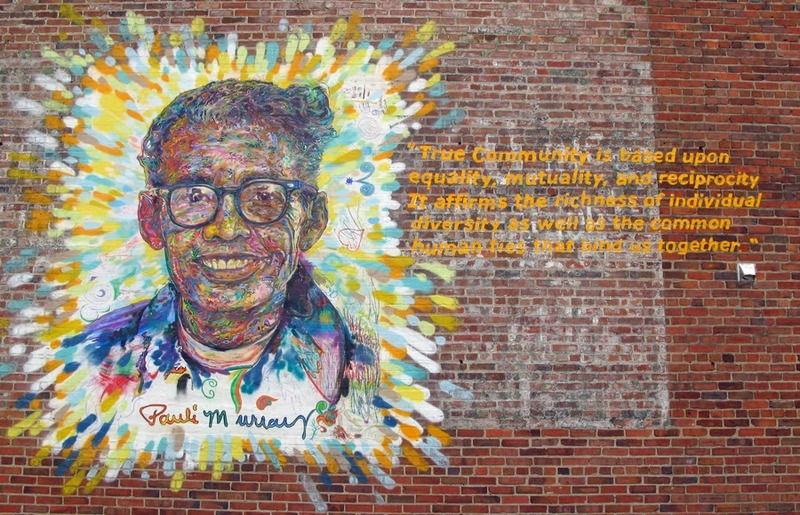 I had noticed the murals during my last 4 years here, but had never taken the time to actually learn about Pauli Murray until now, after I made the decision to draw the mural of her on Foster St. 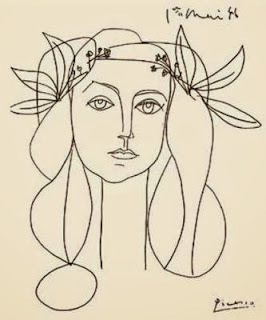 I thought I’d take this blog opportunity to share a little bit more about the woman whose mural inspired one of my drawings for the class! Pauli Murray Mural on Foster St.
Pauli Murray is known for her civil and women’s rights activism, for her work as a lawyer, and for becoming the first African-American woman ordained as an Episcopal priest. Her connection to Durham is through her roots. After her father fell ill with Typhoid fever, she lived with her aunt here in Durham until the age of 16. Later, while traveling to Durham by bus to visit her family, Murray moved out of a broken seat in the black section of the bus to the white section and refused to move back, leading to her arrest. In addition to that bus, Murray spent much of her life facing rejection due to her gender, race, and her label as a radical. She was rejected from studying law at Harvard University for being a woman, from attending the University of North Carolina for being black, and later lost her post at Cornell for being to radical for the institution's liking. All of these incidents, however, only inspired her to work for change. 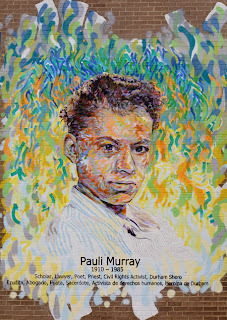 Despite her death in 1985, Pauli Murray's work continues to inspire those today who work toward the same equality and social justice that she wanted to see in the world. 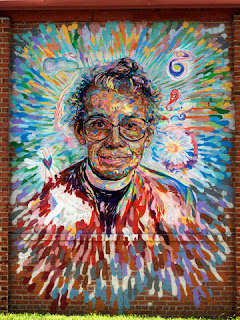 The Pauli Murray Project here in Durham is dedicated to keeping her vision alive and is also responsible for the murals. 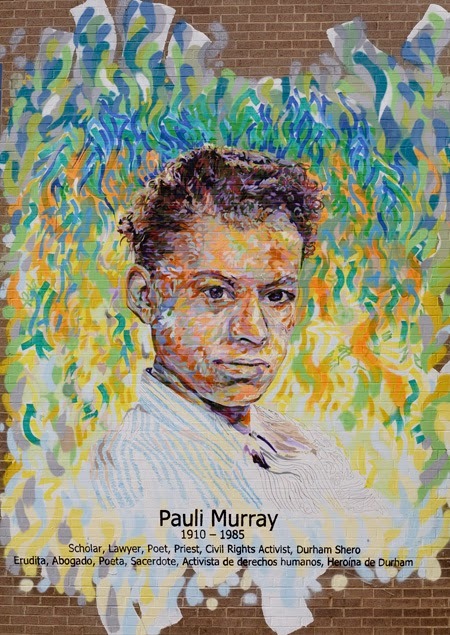 The project's goal is to make Durham a better place through the values that Pauli Murray instilled. I wish I had realized before I finished the drawing who I was including in my work. While I really liked my finished product, the objects I inserted into it could have been inspired by the mural instead had I taken the time to learn more before I finished it. I took Drawing partly to get away from the traditional academia and research I've grown so accustomed to over the last few years. I wanted to stop thinking and start creating, and was under the belief that I had nothing to bring to the table when it came to art and could only sit back and learn. What I now realize though, is that I had an academic, research skill set that could have helped make my work meaningful, instead of just demonstrating my drawing skills. Art is not purely creative, and inspiration doesn't necessarily come out of the blue , it's ok for it to take some work and taking the extra steps get myself inspired. Thank you for a wonderful semester, and good look getting inspired in any future work you do! I'll leave you with the photo of one more of the amazing murals! My first proper exposure to art began when I was 13 and embarked on a language exchange program to France. Over a month-long trip, we were brought to 6 different museums with tour guides explaining the meaning behind every painting and artwork in rapid French. 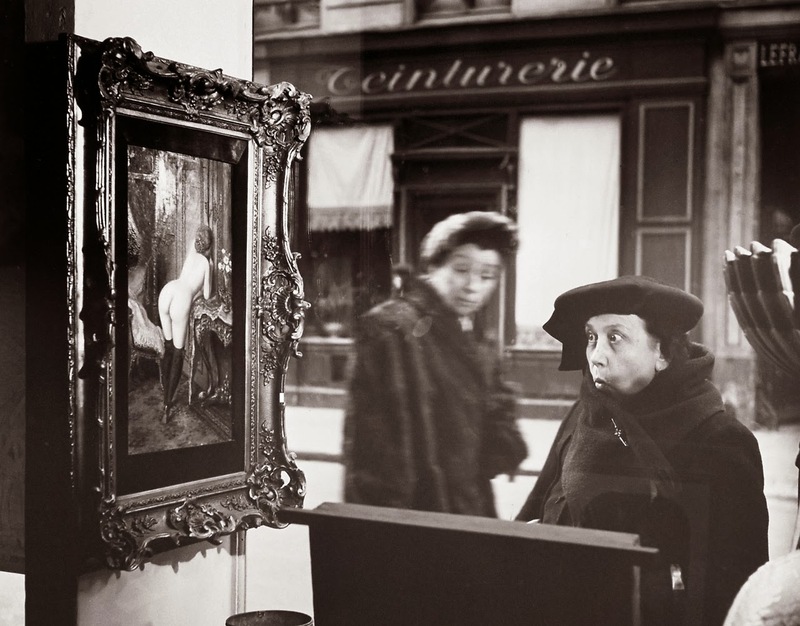 Neither the little-understood French introductions nor any artworks actually left a deep impression at that time, though later on when studying art history for an academic decathlon in middle school, several of the pictures we studied would look vaguely familiar. The amount of detail and accuracy within such masterpieces had seemed incredible to me, as if they were drawn by magic and not by hand. For that reason they always seemed so far away. Despite growing up immersed in math and sciences, art somehow always found a way into my life. When traveling, it became a habit to visit museums - the Getty center in LA, the Van Gogh museum in Amsterdam, the Picasso museum in Barcelona, MoMA and Guggenheim in New York and many many more. Even though I could never comprehend how such masterpieces were produced, or critique a painting the way an art history major or art critic could, it was a pleasure and privilege to be able to just marvel at the pieces and imagine the artists' hand over these timeless works. My favorites were always the museums dedicated to a single artist, where you could see study sketches and works from when the artists were young. I felt like the audience is brought closer to the person behind the drawings, rather than the glamor and fame of the artwork. I never found the courage to draw landscapes or sketch real life objects before this class however, since I deemed myself too unskilled to draw more impressive or realistic themes. It was thus a great experience in this class to be given the push to draw landscapes along with the necessary guidance and advice. Drawing also brought my mind some peace over the span of a hectic semester full of computer science projects and statistics problem sets. It was daunting sometimes to be drawing landscapes, something that I've never done or had training for before, but it was immensely satisfying to be able to complete the assignments. Although this class has ended with the semester, I believe that I would continue drawing for leisure in future. If I had to choose one thing that this class has helped me to develop the most, I would say awareness. By having to study shapes carefully to draw them accurately, I have become more aware of the true forms and shades of the objects around me. I realize that it is perhaps human nature to 'see' symbols of things instead of the things themselves. Drawing from memory tends to result in over-idealized and simplified forms - for example, perfect football shapes for eyes, or a sky full of clouds all with the same shape, or a cube with poor perspective. By focusing on the actual scale and shape of objects (and through experiments such as the drawing of negative space), I have gained a heightened sense of what I'm actually looking at on a day to day basis, seeing more with my eyes than my brain, so to speak. I'm more aware of the effort it takes to create a convincing drawing, both in terms of the mental effort of shaping and scaling all the objects appropriately and the physical exertion of applying a texture or a shade to a large area of a drawing without getting sloppy (never have I more appreciated the computer's functionality of being able to copy and clone). I'm more aware of the stories people conceive as a background to their art. By hearing my classmates discuss what their art meant to them and how they interpreted the events occurring in their depiction, I am left with a better sense of how artists in general think, and understand that there may a be a great deal of meaning behind any work of art that would be difficult to perceive by any way other than talking to the artist themselves. Finally, and most satisfyingly, I'm gained awareness that I'm actually not half bad at drawing. Drawing is the oxygen I need to keep on. I'm not trying to sound dramatic. I started drawing when I was 5. It was hard to separate me from the pencil and the wall ever since. My mother enrolled me in my first drawing class and since then I've gone on drawing for so long that I literally don't know life without it.. except well, last year. My freshman year at Duke was crippling. In a struggle to quickly adapt to the new environment and make new friends, I lost sight of the one thing that I was most passionate for. Drawing keeps me grounded, it keeps me focused, it relaxes me. I tried hard to study for my classes, I went out on the weekends, and I spent the rest of my free time with my friends. Despite all this, I wasn't happy. I felt lost that entire year. I came home that summer after the first year of "the best four years of my life" and cried. It wasn't that I didn't love Duke. I made friends that were absolute keepers - you know, the type of people you know are going to be at your wedding. But I was just so stressed and so tired. My self-esteem was at an all time low. I hadn't been performing as well as I'd hoped academically, and I struggled with coming to terms with the fact that University was hard and giving my all just wasn't enough. I felt invisible in the crowd, overshadowed, and my belief in my self slowly waned. I really sat myself down and asked myself, what was wrong? Why had I lost myself? Why was I so unhappy? The answer was simple. I was disconnected from the one thing that I loved endlessly. A fish out of water can only survive for so long. I was so overwhelmed that I forgot how to breathe. I needed to breathe. People have different outlets to get away from the reality they sometimes feel suffocated in - whether that be dance, music, sports, or another activity. Drawing is my escape. The moment the headphones are in and the pencil is in hand, nothing but the creation in front of my eyes matters. Not a single care in the world. It's magical. Without art in my life, I lost sight of my identity. I also lost confidence in myself, considering drawing was the very thing that gave me something to be proud of myself for. The fire in me had burned out. I promised myself that I would refuel my passion, relight the flame, and that I would never make the same mistake I did again. I can't be without art. I can't give up the one thing that keeps me sane. I made a conscious decision to get involved in Duke arts, and so far, it's been one hell of a semester. In a good way. No matter how stressed I am, how hectic my schedule is, how hard my classes are -- I'm happier. Much happier. I know that the grades I get don't define my value as a person, heck, not even my artworks define me, but it sure is a lot better to know that I'm doing what I love. Taking a drawing class this semester has affirmed my decision to continue with Duke arts. It's the perfect balance to "get away"from the stress of my other classes. I will definitely work hard to achieve a Visual Arts minor. I began drawing in fifth grade after I was enrolled into an art class in my neighborhood. I was taught to draw from photos, or sometimes other drawings. My teacher was of the belief that after drawing something enough times I would be able to instinctively do it myself. It was true to a certain extent. I learned shading, and how to visualize objects from 3-D to paper. However, I didn't know how to simplify objects, or emphasize others. I began to get tired of drawing and copying art, and decided to start up painting. I painted from eighth to twelfth grade, starting with acrylic and then graduating to oil. The biggest difference between painting and drawing is the different ways the artist visualizes their subject. Drawing is about lines and shades, while painting is about blocks of color. However, I didn't even realize this until I found myself working on one of the landscape assignments. The way I tackle drawing something now is fundamentally different from how I used to before I started painting. A pencil to me is now something that creates blocks of color (shades). I don't think of images as lines anymore, and this is reflected in my drawings. Drawing 199 was a flashback to my previous experiences in drawing. It is reminiscent of my teacher and the ways she taught me art. However, at the same time I have realized how much I have grown and how my perception of images have changed. I greatly enjoyed the class, especially when we given the freedom to decide the content of our drawings. I would highly recommend this class to anyone interested in art. My earliest memories of drawing date back to when I was a child and my almost infant brother and I would have “drawing contests”. In my family the love for drawing was deeply rooted in my mother and fathers and thus it spread on to us. When it came to natural talent, my brother stole all the glory as he could pick up a pencil and draw anything almost life-like in a minute. Although I was more methodical and hesitant with my drawings, I always enjoyed it very much and it was one of my favorite hobbies. Unfortunately, when the schoolwork and other activities picked up, there was no more time for drawing. Since entering high school I had been dying to take an art class again and this semester was my first opportunity to do so. This drawing class truly opened my eyes to all the beauty and work behind drawing. Although my parents had always tried to teach us about lines, shading, and space I never processed it as well as I did during this class. It is incredible to see how each line and each mark on the page comes together to define and give a feeling to the piece, sometimes even an unintentional one. It was a great learning experience to go back to the basics and progress forward throughout the semester. As I look at my portfolio, I can truly see a progression in my style and use of different techniques. I know that during some of the last drawings I used the techniques without even thinking about it, almost like it had become natural. During all our drawings I truly felt like I was immersed in the process, and like we said during some of our critique sessions, I felt certain emotions during each of them. Even after this drawing class ends, I do not plan to stop drawing. Amongst my science and math classes, drawing is the perfect change of pace that I want and need. After all the time and effort I’ve put into it this semester, it would be a waste to stop and lose all the technique I have developed. Thankfully, this semester left me with many supplies and if I do not get to continue taking art courses, at least I have the materials to immerse myself in a drawing at home. Perhaps, I may look into drawing with more color, but I also love the feeling that charcoal gives. The opportunity to take this drawing class in college was a great one and it truly has been one of my favorite classes. I cannot wait to return home and hopefully have a drawing contest with my brother once more, where my technique and practice with trump over some of his natural talent. After stepping into our first day of drawing in this class, I was mortified. I was late, struggling to keep a hold of my board and my drawing pad and my supplies, and everyone else was already huddled over their boards, scribbling away. I looked sheepishly at the professor, who told me to go ahead and sit down and just start drawing. As I looked for a seat, I dared to peek at what one of the other students had done so far. Bad idea; they actually knew how to draw, and as I made my way to an empty seat I could feel my face flushing. Wasn’t this an introductory drawing class? Didn’t I ask that before I signed up? Am I in the right place? Good Lord, what have I done? All of these thoughts were flew through my head at lightning speed as I fumbled with my board, trying to figure out how to orient it correctly without making a bigger fool out of myself. Once I got it upright, with the paper and the pencils out and in a good position to start, I just sat there for a good while, alternatively staring at either the mishmash of stools and mannequin parts in the middle of the room (that we were supposed to be drawing) or at the blank paper in front of me. 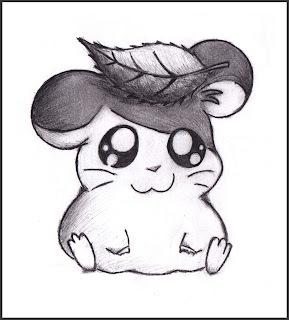 I’m a computer science major, the last time I took an art class was in elementary school, and I’m just supposed to sit down and start drawing? Like everyone else had somehow managed to do? After sixteen years of schooling, that was the most unprepared I have ever felt in an academic environment. Obviously, looking back on that day now, it was nowhere near as terrifying as it was in my head, and I’m 99% sure no one else noticed my extreme embarrassment. After about fifteen minutes of just sitting there, I did end up sketching something resembling the arrangement of items in the middle of the room. I was even proud of myself for a week or two there, as we worked on our line-drawings. The idea of different line weights unsettled me a bit, but I was still following the lessons and feeling confident. When we started shading, however, I was thrown off entirely; while putting together my portfolio, I noticed my “shading” drawing from that lesson, and I cringed. I legitimately did not understand how to make the shading on the items translate into something I could represent on paper with just graphite or charcoal. I really liked the negative space drawing because there was no shading, and even though we only had a week with that, I enjoyed that lesson very much. Even though I still had no idea how to shade, negative space drawing reminded me that I wasn’t bad at drawing, per se, but still just learning. Things started to make sense again with the idea of subtractive drawing, and I started to get the hang of using an eraser to take away value (rather than trying to add it all on with the right weight at one time). I could only figure out how to do this with charcoal, so that became my medium of choice. One of my favorite pieces I did this semester was our first perspective piece, which I did in charcoal with an ungodly amount of erasing. By the time I had completed that drawing, my fingers were blistered from erasing so much and my putty eraser had turned from light gray to black. That was the first time I was legitimately proud of what I had done; the drawing took me a good week and a half to complete, but it actually felt like a completed drawing, and I could literally see the improvement from my first couple of drawings. The next assignment, the photo-insertion piece, was my first foray back into graphite after working almost exclusively with charcoal for a month or so, and I struggled to get the same range of values. I surprised myself, and I was again quite proud of my piece. Our final drawing (which I’m still tweaking as I write this) was our fictional narrative piece; I chose to do an imagination of Doctor Who, a popular British science fiction show, as the subject, but because I was so emotionally invested in the content, I was quite unhappy with most of the ideas I initially came up with. This was the first drawing where I expected it to be good, rather than just hoping, which actually led to some frustration on my part. I eventually settled on the idea of the Doctor surrounded by Weeping Angels, which in essence are statues that come to life when no one is looking; this idea made sense to me given Duke’s gothic architecture and prevalence of gargoyles and statues around campus. As I drew, I fell in love with this idea, and I think I became so focused on the narrative that I lost a little bit of focus on the rest of the drawing. Professor Fick pointed this out in class, and in another first, I was actually sad that he didn’t like it as much as I did. Somehow, over the course of a semester, I went from being terrified of picking up a pencil to instead being so emotionally invested in one of my drawings that I was offended when someone else didn’t like it. Through this class, I improved my ability to draw as well as my confidence in my drawings, and the latter is as impressive to me as the former. I’ve enjoyed this class immensely; it’s made me incredibly proud, frustrated and panicked (at different times, for the most part), and it has also taught me patience and perseverance in a field that I thought I had no business being in. I am very thankful for this experience.